Fr. James Mulligan, CSC, is a well-known and popular figure in Catholic education in Canada. His passion for Catholic education and insights into its challenges and future always draw huge crowds at professional development conferences. And his book Catholic Education: Ensuring a Future continues to attract new readers who care deeply about the future of one of the Church’s greatest resources. Well, Fr. James is back. 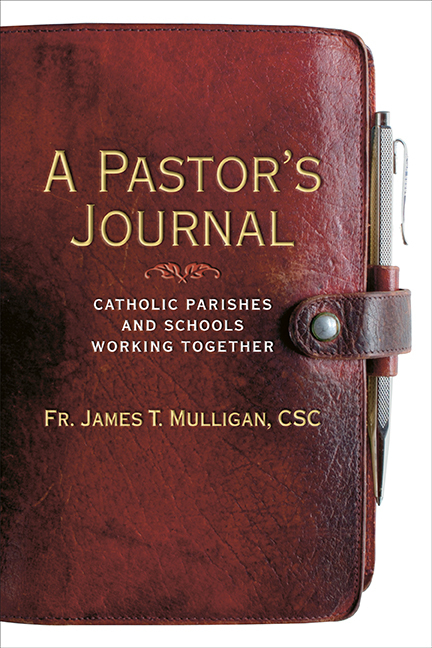 This time, he has written (and we have published) A Pastor’s Journal: Catholic Parishes and Schools Working Together. Unsurprisingly, it explores the necessary but not always easy relationship between a pastor and the schools within the boundaries of his parish. Fr. James does this by chronicling a year in the life of his own parish, St. Kevin’s in Welland, Ontario, with a special focus on all those events in which school and parish work together. Fr. James makes no special claims to having established a model working relationship. At the same time, his commitment to Catholic education means that, at St. Kevin’s at least, the relationship with the schools will be a top priority. So the reader is taken on a journey through the seasons, with an insider’s peek into how pastor and principal work together to make school liturgies and sacramental preparation memorable and holy for all the children, parents and teachers in their charge. Readers will be intrigued by Fr. James’ “Green Binder,” a tool he uses to keep all the ongoing events organized and recorded for the future. We have decided to provide the Green Binder free to purchasers of the book through this web site. You can download its features as Word files and use them in your own settings. Though not specific to this book, Fr. James also includes the parents in his work with schools. In fact, often known as the “three-legged stool”, the Parish-School-Home relationship is at the heart of Catholic education. It’s smooth functioning is a necessary ingredient to ensuring that young Catholics receive the faith education and formation they need to turn into fine Christian adults. Full of wisdom and practical advice, A Pastor’s Journal should be required reading this summer for everyone who cares about the future of Catholic education.